Once again the summer holidays are over and the new season of Autumn activities are upon us. This 2016/17 season will be a particularly exciting one for Sinfonia Chorale as we celebrate 50 years of choral music making. We have three major concerts which offer a wide range of varied choral music. 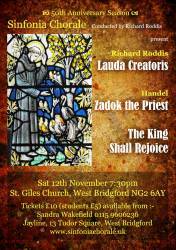 The first of these concerts is at 7.30pm on Saturday, 12th November 2016 at St Giles Church, West Bridgford, NG2 6AX. 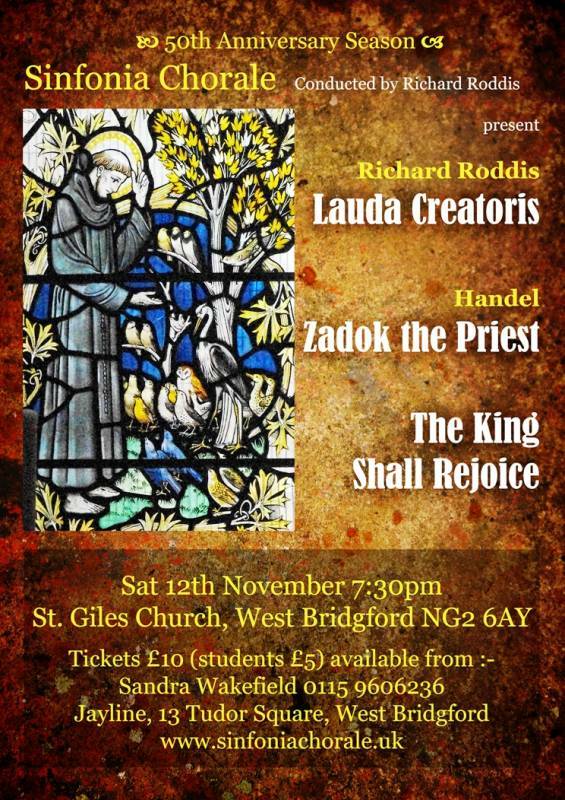 The main work is a composition entitled Lauda Creatoris by our own Musical Director, Richard Roddis. It was originally composed for the 50th Anniversary of the Derby Bach Choir where it was extremely well received. The work celebrates all Creation through the words of the Canticle of St. Francis and the writings of Gerard Manley Hopkins. For this second full performance of his work, Richard has re-arranged the orchestral score for two pianos. The soloists are Natalie Windsor (Soprano) and Dana de Waal (Baritone), with pianists Michael Overbury (our new accompanist) and Clive Pollard. Also in the programme will be performances of some of Handel’s Coronation Anthems including the ever popular Zadok the Priest. Our annual Christmas Concert at Patchings Farm Arts Centre, Calverton, NG14 6NU (from where tickets will be available) takes place on Sunday, December 11th at 7.30 pm. On Tuesday, December 13th at 7.30pm our second Christmas Concert will be held at West Bridgford Methodist Church, Musters Road, NG2 7PQ. There will be a retiring collection in aid of Nottinghamshire Clubs for Young People. Tickets at £8 (£5 for all full-time students) will be available from Sandra Wakefield (Tel:- 0115 9606236) and the website. As usual, the programmes for both these events will include new and traditional music and readings. On Saturday, January 21st 2017, from 10am to 5.00pm our annual Come Sing and Play event will be held at Bramcote Parish Church, NG9 3HD. We shall be studying Bach’s Mass in B Minor and the day will be directed jointly by Richard Roddis and Nicolette Moonen. Those who have attended our workshops in the past will know how exciting and exhilarating these days are. The cost of the day will be £20 (£25 with lunch). Information and booking forms are available from our website. Sinfonia Chorale thoroughly enjoys singing Baroque music, particularly when accompanied by authentic instruments. It is very fitting that we should celebrate our anniversary by performing what many consider to be J.S. Bach’s masterpiece, his magnificent B Minor Mass, in the glorious setting of Southwell Minster, NG25 0HD on Saturday, March 11th at 7.30pm. The Baroque Ensemble will be led by Nicolette Moonen and the performance will be directed by Richard Roddis. They will be available from Sandra Wakefield (Tel:- 0115 9606236) and on the website nearer the time. The conclusion to our celebrations will be a concert at St. Judes’ Church, Woodborough Road, Mapperley, NG3 5HE to be held on Saturday, 17th June at 7.30 pm. The culmination of the evening will be a performance of Thomas Tallis’ 40 part motet Spem in Alium. More details about the programme will be available in subsequent newsletters. We are anxious to trace as many past Members as possible, so if you (or anyone you know) sang with the choir, please let our Secretary, Diane Roberts have the details via e-mail. We do hope you will join us for our special celebrations and we look forward to seeing you at the concerts.